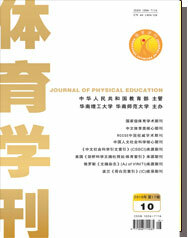 Abstract: Physical education teaching quality is the comprehensive embodiment of physical education teaching ef-fect, mainly composed of the totality of various objective elements reflecting students’ learning effect, referring to teaching result, but not process. The 3 in 1 physical education teaching objective system includes physical health promotion objective, sports skill mastering objective and healthy personality cultivation objective. Effectively en-hancing teaching quality can be started with how to increase the degree of fulfillment of these objectives. The author revealed the following findings: the determination of teaching contents, the setup of teaching objectives and the ap-plication of teaching methods are closely related to the fulfillment of physical health promotion objective; the inten-sification of important and difficult things in sports skill mastering, rational classroom organization and appropriate comments are highly correlative to sports skill mastering objective; good timing, accurate judgment and correct guidance are indispensible for the realization of healthy personality cultivation objective.